A partial map of the distribution of galaxies in the Sloan Digital Sky Survey, going out to a distance of 7 billion light years. The amount of galaxy clustering that we observe today is a signature of how gravity acted over cosmic time, and allows as to test if general relativity holds over these scales. Score one more for Einstein. A new study has confirmed histheory of general relativity works on extremely large scales. The study was one of the first rigorous tests of this theoryof gravity beyond our solar system. The research found that even over vastscales of galaxies and clusters of galaxies, the equations of generalrelativity predict the way that mass pulls on other mass in the universe. The new work also helps rule out a competing theory ofgravity that seeks to do away with the need for bizarre concepts like darkmatter and darkenergy that have irked some scientists. This research indicates those peskyideas may be here to stay. General relativity rocked the world of physics when Einsteinfirst published his paper on the subject in 1915. The theory built on thetraditional idea ofgravity based on Isaac Newton's laws, but added fundamentally new conceptslike the notion that mass deforms the shape of space-time. This means thatobjects and even light that move through space near a large mass will travel ona curved path. Furthermore, it means that mass can stretch or shrink time aswell. For example, someone watching a black hole from a distance would observea person falling into that black hole to fall extremely slowly. To test this theory over distances up to 3.5 billion light-yearsfrom Earth, researchers analyzed a survey of about 70,000 galaxies. Thescientists combined three different measurements. First, they calculated theweak gravitational lensing caused by the galaxies ? that is, they measured howmuch the galaxies' mass was bending light from other galaxies around them bynoting the average distortion of the surrounding galaxies' shapes. Then, they combined this data with measurements of thegalaxies' velocities to learn how the galaxies were moving toward and away fromone another. Finally, the astrophysicists calculated how clustered the galaxieswere together over various distances. All of these measurements combinedcreated a system to test theories of gravity independent of particularparameters in the theories. The scientists found that general relativity is consistentwith their observations of the universe at large scales. They also tested two competingtheories ? the tensor-vector-scalar gravity (TeVeS) idea, and anothercalled f(R) (pronounced "f of r"). The quantities predicted by f(R) were somewhat differentfrom those observed, but still fell within the margin of error of themeasurements, so this theory is still a possibility. TeVeS, however, madepredictions that fell outside the observational error limits, so scientiststhink they can probably eliminate this theory from consideration. "It wasn't clear at the outset that our errors would besmall enough to be able to rule out other models ? 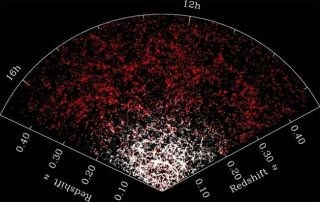 it was a nicesurprise," said study leader Reinabelle Reyes, a graduate student atPrinceton University in Princeton, N.J.
TeVeS was already looking doubtful based on recentobservations of a pair of colliding galaxy clusters called the bullet cluster,which offered strong evidence for the existence of dark matter, Reyes said. Thenew research offers another nail in its coffin. While general relativity was already pretty well acceptedamong physicists, the new findings offer more solid support for the theory. "It's good to know that general relativity isconsistent," Reyes told SPACE.com. "Now we have something to hold onto saying the universe really works that way." The study was detailed in the March 11 issue of the journalNature. To further judge between Einstein'stheory and other ideas, including f(R), research on more galaxies will benecessary to reduce the margins of error on the data. "Reyes and colleagues? measurements are significant notjust because they are consistent within error with general relativity, but alsobecause they point the way to future high-precision tests that will betterdistinguish between general relativity and some variant models," physicistJ. Anthony Tyson of the University of California, Davis, wrote in anaccompanying essay in the same issue of Nature. Tyson was not involved in thestudy.